While planning our hike of the Appalachian Trail, we decided to do a fun hike. Yah, right! I believe it was 16 miles, in one day. We started at the Alum Cave Bluff Parking lot, and hiked to the top of Mt. 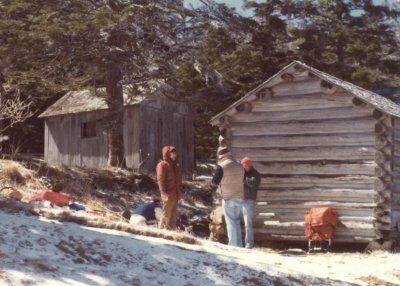 Leconte, the tallest mountain in the Smokeys. We started, early in the morning, and it was 13 degrees. It was okay, because we were layered. Soon after hitting the mountain, we started removing the layers. That trial is fairly steep in some places. There were a bunch of us, but I do not remember all their names. The doctor diagnosed me with CRS a while ago, and I struggle with it today. CRS is a common malady known as "Can't Remember Squat". Gary Smith, Chuck Ochiltree and Mike Flynn were some of their names. 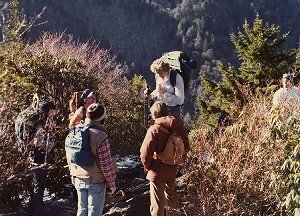 When we got to the top of the mountain, we ate Dinty Moore canned stew. Normally, I would classify that as glorified dog food, but up there it was food fit for kings. We used our little cookers to heat it up. We had 'gorp' and fruit, but the grease was wonderful. There is a lodge at the top, accessible only by hiking or horseback. You can reserved a space at the lodge during the summer months, but you had better plan on reserving two to three years in advance. Very limited space. The picture shows the accomodations. Yes, these are log cabins. They do have a generator for some lighting, but it only runs for a few evening hours. They do serve great meals though. Of course, you had to hike up there to get them, so Campbell's Tomato Soup is like the finest gormet soup you can find. It was cold on the top of the mountain, and the layers went back on. I probably have too much on, but I was comfortable. It had snowed on top, and there was a lot of ice every where. We were cautious not to fall, because it was a long way to a doctor. The views on top were magnificent. Due to the cold, you could see a hundred miles or so. Mountain, mountains, mountains. We could see some towns, but I cannot remember which ones today. All in all it was a great start of our day. Now the fun part began. We started down the north side of the mountain. Any skiier can tell you about the north side. It is always colder, snowier, and there is always more ice. The trails had ice all over them. 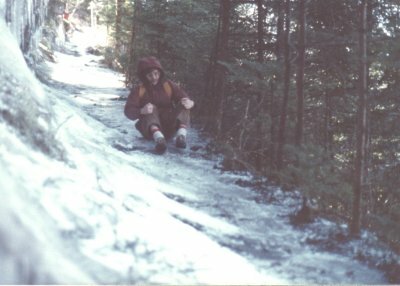 Some of us used our home made 'crampons' to navigate the ice. We took straps, and pop-riveted coke caps to the straps and tied them around our boots. Some of us did not have these things, and resulted in bottom sliding the treacherous parts. The drop off here is about 50 feet, straight down to the hiker's left. The trail is literally cut out of the side of the bluff. Those trees to the hiker's left are very tall trees. The top of the mountain was the worse part. a couple of miles down the trail, and we were back in good territory. The worse part of the return, which was not down the way we came, but down the back side toward Gatlinburg was the going downhill part. Downhill? 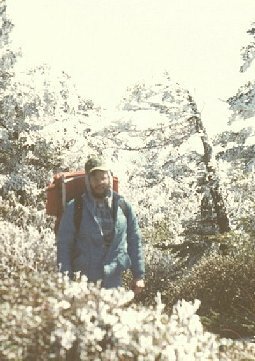 No one told me about downhill hiking. Parts of my legs that I did not know existed started hurting. My toes kept sliding forward, and hitting the front of my boot on the inside. I had to stop often to tighten my boots. 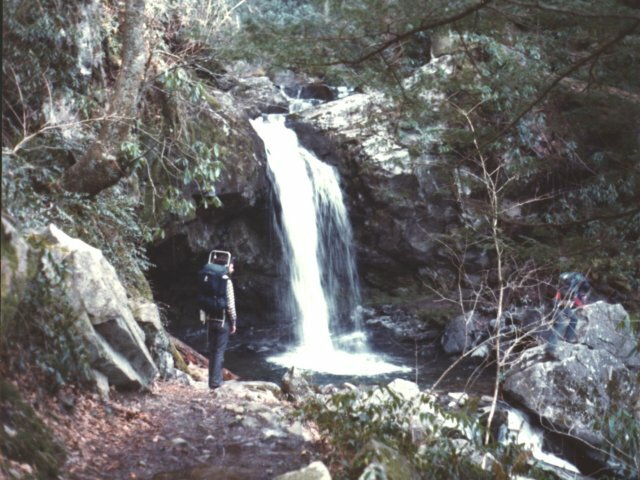 There were, however, wonderful water falls and streams to see, and we enjoyed the day. At the end, we were all very tired. I piled in to the back of the Suburban, on top of a bunch of gear, and did not move until we reached the other vehicle. Now, back to get a meal, a real meal, and since I was not driving, a long nap home. I still slept very well that night. The first part of the trip was about six miles. Next time, I think I will come back the way we went, instead of the long way.